This necklace is my latest creation. It features an image which is only part of a fresco found in the Bronze Age settlement of Akrotiri, Santorini, depicting Saffron-Gatherers. Frescoes there have kept their original color well, as they were preserved under many meters of volcanic ash. They are Minoan culture wall paintings, and the one whose part I used in my necklace shows saffron-gatherers who offer their crocus-stamens to a seated lady, perhaps a goddess. 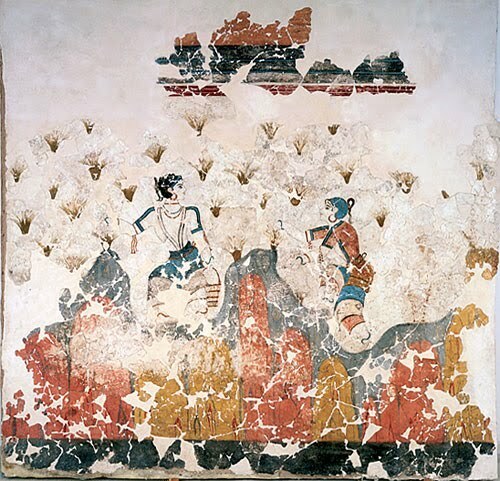 Crocus has been discovered to have many medicinal values, including the relief of menstrual pain – and this has led many archaeologists to believe that the fresco of the saffron/crocus gatherers is a coming of age fresco, dealing with female pubescence. The setting I used to make this piece is of course of an antique bronze color, as is the wonderful chain and the findings. I wanted to combine a Bronze Age painting with an oval setting of a scalloped edge, and a rope pattern that runs all around it. I liked the idea of substituting a carved cameo, so common in ancient and renaissance times, with part of a two-dimensional fresco. To finish this necklace, I incorporated a teardrop-shaped black lava bead; I found the lava stone very appealing, and very suited to the theme of my creation. After all, the Thera eruption was one of the largest volcanic events on Earth in recorded history. The very island of Santorini is what remains of an enormous volcanic explosion, destroying the earliest settlements on what was formerly a single island, and leading to the creation of the current geological caldera. Which, to me, makes lava a symbol of metamorphosis, continuity and, ultimately, life. gorgeous necklace and lovely post about it! Interesting read and such a beautiful pendant! Wonderful artwork!!! As a lover of ancient civilizations and archaelogy, your gorgeous necklace makes me dream of Santorini in ancient times! Thank you for sharing! I love your very unique jewlry!